This is the final stop on the tour so let's make sure we show them some Cleveland and Cornell pride. The concert will be at 8pm with a reception to follow. Tickets are required, see below for more information. We are Delaney Ding '19 and Chris Umeki '19, the tour managers for the Cornell University Glee Club, Cornell's premier men's choir. 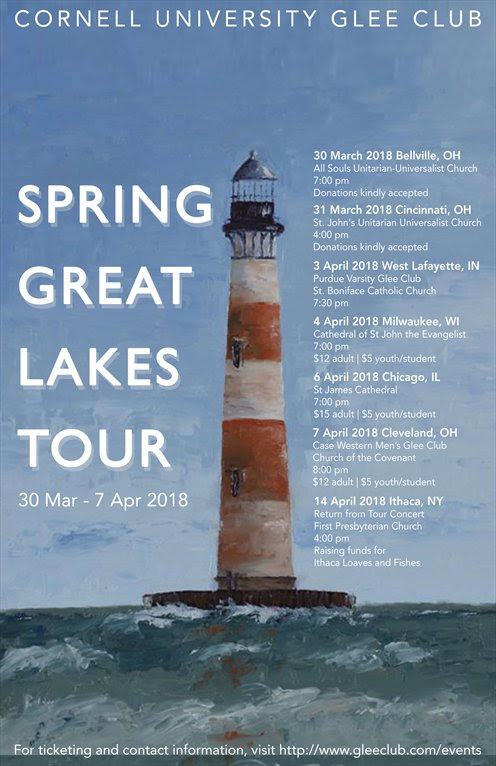 We are excited to announce our upcoming 2018 Great Lakes Tour concert schedule. On this tour, the Glee Club will perform music from cultures across the world, including this year's Thomas Sokol Commission, I Do Remember by Anders Edenroth. You can listen to our recent recordings and performances here. Tickets for select concerts shown below can be purchased online or at the door for an additional $1, unless otherwise noted. Be sure to check in and share our concerts on Facebook. We would love to see you at a concert! Each of our concerts concludes with beloved Cornell songs, and we always invite alumni to sing along! If you have any questions please contact us at tour@gleeclub.cornell.edu. Hope to see you soon, and Let's Go Red!